Soya drink, vanilla flavour, with added calcium and vitamins. 100% plant-based. Source of protein. Low in saturated fat. + Calcium & vit. B2, B12, D. 30% less sugars. ProTerra Certified - sustainability non-GMO soya. Free from dairy, gluten and wheat. Free from artificial colours and preservatives. 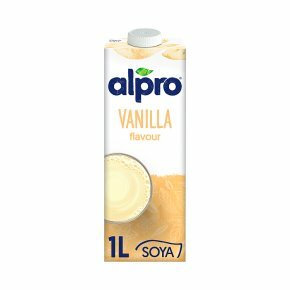 Suitable for vegans.30% less sugars* great taste *Did you know that Alpro®Soya Vanilla contains 30% less sugars than the market references in vanilla flavoured milk drinks? Enjoy plant power Good for you Nutritious and a source of high-quality soya protein, which contributes to muscle maintenance. Easy to digest as naturally lactose free. Naturally low in saturated fat.